C continues to surprise me when it comes to his (not so) new little sister. This month he has been learning how to say her name. He can't quite get it yet but he's really trying. She is also "my baby" not mummy and daddy's. He can be a little heavy handed with her. Trying to squeeze her head and forcing her dummy into her mouth when she doesn't want it but he's not to know. He's just trying to be a good big brother. 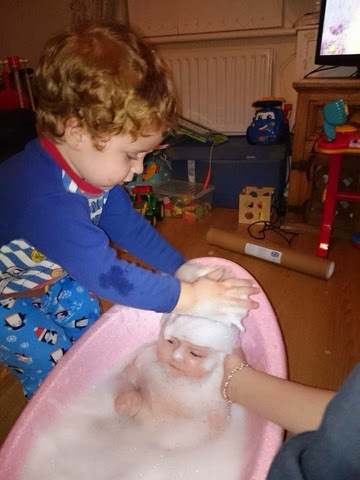 When I was giving E a bath, C wanted to join in. He was very gentle with her and helped me to wash her hair. This was actually the first bath time where E didn't cry. Maybe she liked having her big brother helping! 1 comment on "Siblings: November"